You remember how I finally did Buy Kindle and shipped my Amazon Kindle to India and shared the Kindle unboxing pics. Now this was surprising when I spotted this Kindle ad. Could I get it cheaper in India? I checked the url provided and it links to Indiatimes, one of the largest online shopping stores in India. I visited the provided url shopping.indiatimes.com/ro which links to a special “Readers Offer” and searched for Kindle and it was there. The starting price Kindle 6in wifi model is available for Rs 9315 (they also offer an EMI of Rs 1552 for 6 months) and add to it Rs 299 shipping charges. 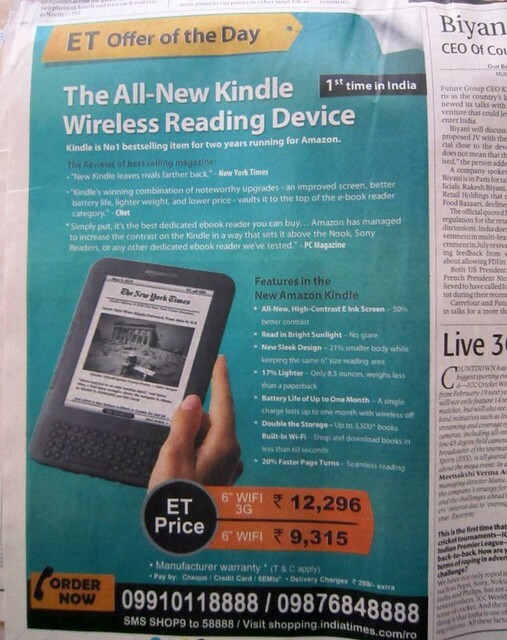 The Kindle wifi+3G model is available for Rs 12296 (EMI Rs 2049 for 6 months) + shipping Rs 299. Both models will ship within 10 days. It says you can order a maximum of 5 kindle pieces. Considering I got my Wifi+3G Kindle shipped to India from Amazon USA for $283.92 (which included shipping $20.98 and import duty fees of $73.94), the price here is approximately the same. So now you can own an Amazon Kindle in India under Rs 10000 and pay in Indian Rupees with your local India credit / debit card, net banking or bank cheque!